Thum! Kaun Aata Hai? : Russia Ready for 50% Work Split in FGFA Development, But IAF Beware What You Wish For! Russia Ready for 50% Work Split in FGFA Development, But IAF Beware What You Wish For! Russian Embassy officials have told The Hindu that an agreement on the FGFA is likely as early as January 2015. The Russians contention is true and we need to swallow our pride and mull over it! The Indian press has been harsh on the Russian for their reluctance to concede a 50% work-share split in the development of the PMF/FGFA variant of the T-50. 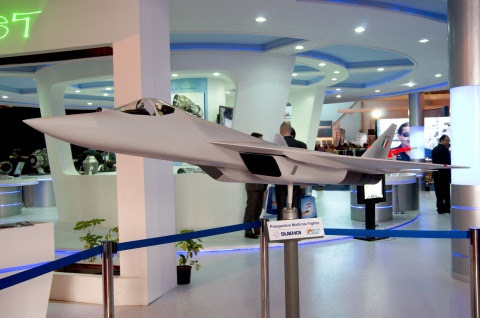 As I pointed out in an earlier blog post, under the FGFA project, India and Russia plan to jointly develop a version of the Russian T-50 stealth fighter customized for IAF requirements. The Indian version, referred to as Perspective Multi-role Fighter (PMF), would use the same airframe, engines and main systems as the T-50, but differ in its avionics and weapon suite. Development of the PMF version of the T-50 is expected to cost $11 billion with India and Russia contributing $5.5 billion each. In plain English, the PMF would be customized version of the T-50, just as the Su-30MKI is a customized version of the basic Su-30 design. The IAF intends to use PMF as its front line stealth fighter. The Russians want the PMF to be the export variant of the T-50. Both countries have high stakes in the project, not to mention $5.5 billion dollar each investments. Neither side would want the stealth characteristics of the T-50 to be compromised by PMF modification, as would happen by adding a second pilot seat or enlarging weapon bays to accommodate any India specific weapons. Both sides would want the PMF developed in quick time. Both sides would want to ensure that software tweaks required for the PMF variant are implemented quickly without breaking existing T-50 code. Most importantly perhaps, both sides would want project costs to remain locked at the projected $11 billion. Its a no brainer that Russian experts would give the IAF what it wants faster and more cost effectively than HAL. Why then the pedantry of a 50-50 work split? As to the need for TOT, why not link the PMF contract to Russian assistance in developing the AMCA. ADA is kidding no one by projecting that it can develop the AMCA on its own in a time frame that guarantees the aircraft's relevance, something that it couldn't do with the LCA! IDP Sentinel members can read more about the FGFA project at the link below.